The universal laws governing the dynamics of interacting quantum particles are yet to be fully revealed to the scientific community. A team of researchers at the Center for Theoretical Physics of Complex Systems (PCS), within the Institute for Basic Science (IBS in Daejeon, South Korea) have proposed to use an innovative toolbox that enables them to obtain simulation data of equivalent to 60 years' experimental time. By extending the computational horizons from one day to unprecedented time scales, the IBS researchers were able to confirm that a cloud of quantum particles continues to spread even when particle to particle interactions, originally deemed to be the activator of the spreading, exert almost no strength. Their findings were published online on 30 January 2019 at Physical Review Letters. Hot debates over the past decade were devoted to the question of whether the process will stop because the effective strength of interaction becomes too low, or not. Experiments with Bose-Einstein condensates of ultracold Potassium atoms have been conducted for up to 10 seconds as researchers try hard to keep the atomic gas stable. 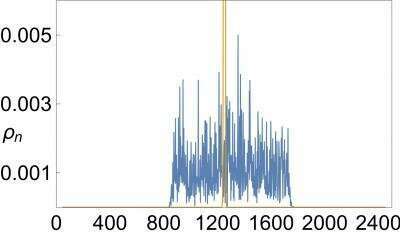 Numerical computations were performed for an equivalent of one day. Remarkably theoretical computational physics was already in a unique situation to be way superior to experiments! The research team observed subdiffusive clouds spreading up to the record timescales investigated. The key to the success was the usage of so-called Discrete Time Quantum Walks—theoretical and experimental platforms for quantum computations. Their unique feature is that time doesn't flow continuously, but increments abruptly, becoming one of the main speedup factors. Several additional technical tools were used to realize the new record times: massive supercomputing powers of IBS, program optimization, and the use of clusters of graphical processing units (GPU). The results of the team pose complicated new questions on the understanding of the interplay of interaction and disorder. IBS-PCS researchers continue to work on different aspects of the problem, using tools including Discrete Time Quantum Walks. "We are currently employing the same technique to crack several other long-standing problems that require novel computational approaches and powers", says Ihor Vakulchyk—Ph.D. student of the research team. The proposed toolbox opens seemingly limitless possibilities for the novel field of Quantum Modeling and optimization of computer models in physics. Ahh, what a conundrum. Pay for sixty years of experimentation? Or pay for simulations using expensive computer time? As generally, those video gaming dependent lifestyle, subsidized by public welfare programs, the altright fairytails are the loudest to gobble their dismay at any expensive scientific research? Are also the same woosheeple who bleat their dismay at the efficient use of computer modelling & simulations. Going to be fun watching them twist themselves into a Mobius Strip!